The idea that this is a sword is based upon the assumption that the 'c' could have been used in two different ways, as a soft 'c' or hard 'c'. The hard 'c' would be Old English, whereas the soft 'c' would be Latin, and it is quite feasible to assume that the Runic Initiates knew Latin at the time these runes were being used and recorded. (The Calc-Rune seems to have a Latin name.) However, in looking at this as a double-meaning we have to consider that we also have 'Cweorth' using a hard 'c', and this must have an important meaning. 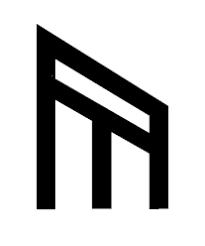 As I have said before, the Peorth-Rune is a name using a letter that is not used in Germanic Tongues. As in the above it is a dice-cup, or the 'Swan-Ship' that floats upon the Waters of Chaos at the end of a world-age. In its usual position it is the posture of the players of the Taefl-Board. I have suggested that this is perhaps also Weorth meaning 'wyrd', 'worth' or 'becoming'. It is the 'womb' of the woman giving birth - a birth-rune. It is also a rune used to break shackles or bindings. 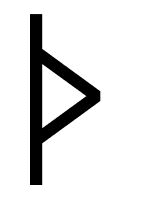 It is the name of the rune itself that interests us here, since it links to Cweorth/Sweorth in sound. Although I am unsure of any meaning of the actual rune-sound 'Cweorth' that this rune represents 'Ritual Fire' or 'Cremation Fire' is itself of interest. If Hamasson is right in seeing this as the Broken Sword this fits with the Graal Mythos where the Broken Sword features in some versions. Of course, these fit with Germanic Myth - the Myth of Sigurd. This seems to be the source of the Legend of the Broken Sword that appeared in the Graal Mythos. In Welsh Legend this is a Flaming Sword and this is of interest to our work on the subject. The connection of this rune with fire makes this a Flaming Sword. This is not just in Welsh Myth since we have (indirectly) the legend of the Battle-Flame, sword of AEtla the Hun, passed to Hengest. The legend of Kalki Avatar also features a Flaming Sword. We should also recall that the Flaming Sword guarded the Garden of Eden or Garden of Idunn. The Ogham has Quert using the Latin 'qu' which has its parallel in 'cw'; this stave links to the Apple Tree. Offa Whitesun saw this as a link to Avalon, the Island of Apples, and thus to Valhalla. This may also link to the goddess Idunn who is the Guardian of the Golden Apples of Immortality. Seen in this way it also relates to the planet Venus and to the Waene-Gods. The two different ideas relating to 'immortality' show this rune to represent the Way of the Gods. 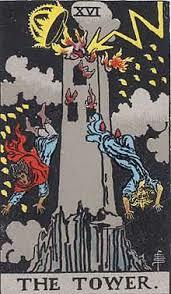 If we link the Four Hallows to the Tarot Cards which seem to have developed into our 'Playing Cards' there may be a case for seeing the Tarot as hiding the Graal Quest, as some have stated. Miguel Serrano, and others, have linked the Graal-Quest to the Royal Arts - Alchemy - which does seem feasible. But because of the vagueness of this, having to be hidden from the eyes of the Christian Inquisition, this is a rather hard subject to understand. Calc is clearly a Latin word related to 'chalice' and also to 'chalk' (calx), one meaning 'cup', the other 'white stone'. The glyph itself refers to the roots of the tree, as opposed to the branches seen in the Eolhs-Rune. Although it is in a way the 'Death-Rune' this must be interpreted literally but also of the Death Mysteries. If this means 'chalice' why is this shown as being upside-down? Logic would have it upright as in the Eolhs-Rune. If this is upside-down then it is pouring the liquid out, which seems to lead us to the symbol of the 'Water-Bearer' - Aquarius. 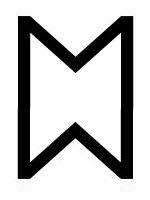 In this respect this rune could well be seen as the Waters of Dissolution since water is symbolic of a transformation into a liquid state which flows and is not static or ordered - the Waters of Chaos. In this sense 'death' can be found in the meaning of 'dissolution' since it is in a way a kind of 'death' in the sense of change or transformation. 'Water' in this symbolism rather means 'fluidic', a change from a solid, stable, ordered state to that of a constantly changing state that we find in the Age of Chaos. But this rune can also refer to the Mystical Death which is necessary to achieve the state of being 'Twice-Born', or being 'resurrected' from a near-death state. At death the body returns to the Earth, whether buried or burned and the ashes scattered, or to the waters (burial at sea or 'Viking' ship-burial). The idea of the God of Death as 'The Ferryman' shows a belief in the crossing of the waters at death, the way to the Otherworld. In some versions of the Graal Mythos the Holy Spear is plunged into the Holy Graal, the latter being the cup used by 'Jesus Christ' at the Last Supper. And here we face the problem, since much of the Graal Mythos has been clouded by Christian dogma. But shining through this symbolism is the 'Holy Blood'; in some versions this drips from the Holy Spear, the blood that was spilt (again) from the side of Christ. Whatever the Christian usage the original meaning still comes through. This rune I have covered so many times that it would be boring to go over the whole thing again. This is the Holy Stone of Ing and although there is the 'Stone of Destiny' (of the Tuatha De Danaan) and the 'Kings Stone' (Kingston in Surrey) the one that should be of most interest to the English Folk is the Stone of Ing which recalls the Divine Ancestor of the English Tribes. This version recalls the 'anvil' (when turned sideways), and in some versions of the 'Sword in the Stone' the sword is thrust through an anvil. We thus here have two distinct symbols relating to the 'Sword in the Stone', the original version of which seems to be the 'Sword in the Tree'. 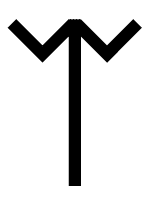 The Nyd-Rune can be seen as the 'Sword in the Tree' or the 'Sword in the Stone' and when pulled out (by the Divine Hero) this represents the Ego (I) made whole again. Most modern 'paganism' is based upon some form of Celtic Mythology or Celtic Lore; but when we look at the Celtic Lore passed down to us some of the 'Thirteen Treasures of Britain' are firmly based upon the idea of a 'Divine Hero' being the only one able to do certain things through these treasures. There is very little of the 'Divine Hero' found in modern 'paganism' though and these themes are pushed firmly aside. Most of the 'Thirteen Treasures of Britain' have parallels in Norse-Germanic Lore. They have the same roots. The anvil is related to the Divine Smith - Wayland the Smith - who is the forger of swords for the heroes. Regin the Smith forged the Sword of Sigurd, which the latter used to slay the Dragon and gain the Gold-Hoard (Solar-Wisdom). In doing this Sigurd became a 'dragon' by eating its heart and drinking its blood - he took upon himself the Soul and Spirit of the Ancient Dragon-Lords. This is paralleled in Celtic Mythology but in this it is the Salmon of Wisdom rather than the Dragon. The idea of 'waters' and 'flood' gives rise to the symbolism of the 'Fisher King' who is the Sacral King who is wounded in the thigh and thus becomes impotent, lacking the virility and the ability to resurrect the Folk and the Land, which has become the 'Wasteland' because of his 'wound'. The quest for the Graal is based upon the quest to heal the Wounded King and thus the Land and the Folk. This is perhaps the most important symbolism of the whole Graal Mythos, and the one most overlooked. Not surprising when we recall that it is not in the interest of our enemies to allow this to happen. Ingvi-Frey gives away his sword in order to wed Gerda - the Earth-Mother. He is thus very much like the Sacral King who has to wed Sovereign, the Land, so that they become one - An Land - An Blod. Indeed, Ingui is the archetypal Sacral King which is part of the Waene-Cult. Before we can 'heal' the Fisher-King perhaps we need to recognise who and what he represents. In the figure of Ingui we may well have a pre-Flood Divine Hero like the Manu of the Aryans. In fact, the 'Son of Manu' who leads the Aryan Tribes out of At-al-land as it is sinking beneath the waves of the Great Flood. Hence his association with the sea and crossing the seas. We should not forget that the father of Ingvi-Frey is Njordh who is associated with the seas. In some versions of the Graal Mythos the Fisher King guards the Four Hallows, or some of these objects. Some early versions equate him with Bran whose name means 'raven' or 'crow'. Bran is the figure whose head is severed and buried at the White Mound in London. He was said to have been a King of the Silures in South, and here we may have a solution to the overthrowing of Bran by the whiles of Gwydion (Woden) when Germano-Celts defeated the Gallo-Celts (Silures). The various versions of the legends around this figure suggest there may have been different beings put together in legend. In the 'Harry Potter' series, which was developed as a propaganda exercise against the idea of 'Pure Blood', as shown clearly in the various films, we find that in order to destroy the 'Dark Lord' certain 'hallows' have to be searched for and used in certain ways. Each 'hallow' has certain powers. This is an Aryan Myth turned on its head. The Elder Wand is the upright stave. The Cloak of Invisibility is the triangle. The Resurrection Stone is the circle. At least this is how I see it which seems logical. Apart from this we find no real link here with the 'Four Hallows' and these seem to have been lifted from the same ideas and used in a work of fiction. We can see in the launch of the 'Harry Potter' films how the system works - it was launched at the same time as a 'backlash' was created by Christian 'fanatics' who saw this as a work of the 'occult'. The publicity created by this 'uproar' sold the film to the masses - another piece of expert propaganda. The Sword - This can only be taken from the tree or stone by the chosen hero; this hero is a Divine Hero, a demi-god who is descended from the gods. The Cup/Cauldron - Disregarding the Judae-Christian ideas that surround this there is a hint that the San Greal is the Sang Real - the Royal Blood. And this is contained within the cup or chalice. This being said the cup or chalice has to be the 'vessel' of this Pure Blood and in a sense represent the Aryan Man or 'Solar Man'. On the other hand it can also symbolise the Aryan Woman, with the Spear of Woden being the Aryan Man 'thrust' into the 'cup'. This sexual symbolism can be found in Wagner's Parsival and Crowley stated that the OTO supplied Richard Wagner with this symbolism. 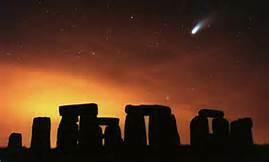 The Stone - In regard to the Stone of Destiny, and other stones having similar legends, the stone itself cries out, thus choosing the Rightful King itself. In a sense the land chooses the Rightful King. The 'Graal Stone', however, does not seem to have this idea and is sometimes seen as the 'Philosopher's Stone' which is the ultimate aim of the alchemists. It is the Stone of Exile which is a different thing altogether, suggesting that it in some way belongs to an 'exile', usually an idea associated with a ruler or a king. Of course, it could refer to a people in exile. The Spear - The Spear of Woden can represent the Cosmic Axis; it can also represent the 'Spear of Authority'. In some Graal Legends the spear is wielded by Parsifal and used to destroy the powers of illusion that bind the Graal Knights and the Fisher King. The Spear of Destiny is wielded throughout the ages by the Warrior-Heroes, as can be seen from the legends that surround it. Discs - This would be the 'stone' but does not seem to fit in any way here. Our modern playing cards derive from the original Tarot, which is not surprising since the tarot was originally a set of playing cards, and only later did its use for 'divination' come into the picture. Since there are 22 Major 'trump' cards it is likely that this links to the Jewish Cabala, their alphabet having 22 letters I believe. Sets of playing cards with diamonds, hearts, spades and clubs is really no help here since they don't fit very well with the 'sacred objects'. 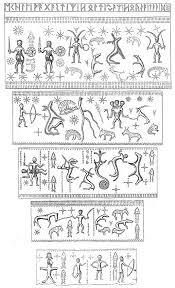 We can see how, with the runes, there is a kind of obsession with their being simply 'tools of divination', used to foresee the future. The tarot cards are used for the same purpose, although clearly they have a deeper and more secret meaning. Since divination was a far later development, and seems to divert attention from their true inner meanings, maybe this was done deliberately. The Twin Towers hit by planes. The buildings set on fire. People jump from the buildings as the fires spread. The 'crown' falling from the top represents the ruling elite of that era whose reign is toppled. Since we find that the era in which the Tarot developed was around the same time as the fall of European Monarchy and the rise of the Third Estate (Mercantile-Capitalism) the 'crown' symbolism fits perfectly. The symbolism of the Twin Towers is that of a change from the Third Estate (the Twin Towers of Global Capitalism) to the Fourth Estate (the Age of the People). This is the change of a world-age. What we do not know for sure is whether these events are part of an 'Occult Agenda' since from records we find that the Grand Orient Lodge of Freemasonry were responsible for the French Revolution which overthrew the French Monarchy and thus gave power to the 'Third Estate'. The same applies to the 'Twin Towers' which have been seen by some as a 'conspiracy'. The tarot could be about the Cycle of the Ages, or it could be a hidden Occult Agenda - or both. Whatever the case this has little to do with the Four Hallows. The earliest and clearest example of the Four Hallows comes from Ireland through the legend of the Tuatha De Danaan. As I have said before, this is a Mythical Race and as such these four treasures come from another world and are thus Mythical Treasures and should not be seen as physical objects. Unfortunately, when we start to study Irish Myth and Legend we come across a stumbling-block. Knowing that the Tuatha De Danaan are mythical, the Irish claim descent from the Milesians, but when studying the subject we find that nothing within these later legends fits to the historical tribes shown in Ptolemy's map of Ancient Ireland. And worse, many of the names credited to the Milesians seem to be clearly derived from Hebrew names of the Old Testament. We have to remember that such legends and myths were written down in very late times and so may have been distorted. 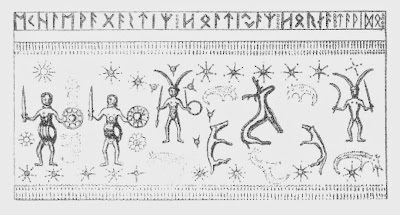 What we do not know is how the Four Hallows and thus the Graal Runes came to be within the 33 Anglo-Frisian Rune-Row, and why these runes had no rune-poems. Clearly, the fact these have no poems like the rest sets them apart, no doubt to hint at some hidden meaning for this. Most scholars see the extra 9 runes as being 'added' to the Elder Futhark, but Marby suggested that they were the original 33 runes used in 'Atlantis' - At-al-land. So who is right? There seems one important thing that scholars have overlooked, and that is that the runic-horn of the Horns of Gallehus uses the Elder Futhark, but it has an Ear-Rune or Cweorth-Rune as a runic-posture on the top row. This means that the extra runes (or at least one of them here) were known and used in this area of Denmark at that time. The Sword in the Tree/Broken Sword, the Cauldron/Kettle, the Stone of Origins, and the Spear of Woden all appear in Germanic Mythology, even though not together as the Four Hallows. In the Irish Legend they are wielded or used by the Tuatha De Danaan - the Aryan Gods. In Welsh Legends they appear as part of the 'Thirteen Treasures of Britain'. It seems clear that they were known since ancient times here in these islands, which suggests that the Rune-Masters were fully aware of this and if they were 'added' to the standard rune-row it was due not only to this knowledge, but also because they were seen as important at that time. The alternative is that there were originally 33 runes that have been used since the time of At-al-land, and that the 24-rune row had the extra runes taken from it, as happened with the Younger Futhark. We must remember that the medieval legends of the Graal were hundreds of years later than these early times and there is a 'gap' in between where these sacred objects seem to have had little importance. The Graal Legends seem to have erupted at a certain period of spiritual decline; since they, like alchemy, seem to be based upon the quest for immortality then they held these secrets of how to achieve this aim. Getting back to 'Harry Potter' and the ideas that the author put into the books, the 'Deathly Hallows' were themselves Magical Objects that could be used to counter opposing forces. No matter that in these books the 'Dark Forces' are the 'Light Forces' and the 'Light Forces' are the 'Dark Forces' the same archetypal theme applies. But the ideas used by the author are sound in that the original sacred objects were used by the Gods in their wars against their enemies, so we have a clue here to their meaning. This does not negate the ideas on their use to achieve immortality, since this too is all part of the same struggle, as Miguel Serrano clearly shows in his works. Of course, J.K. Rowlands is not the first to have used the idea of a quest to find certain hidden objects of a magical form which are used against an enemy, especially a 'Dark Force'. This has been the theme of many 'fantasy' films; it was the core of the 'psychic questing' that features in some of the early books of Andrew Collins. It is also true of modern movements who have sought out ancient weapons, such as the Spear of Destiny, which are used as 'Talismans of Power'. 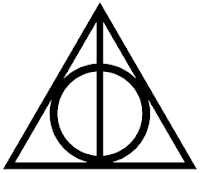 The Four Hallows are found at the very end of the rune-row which has to have a significant meaning. 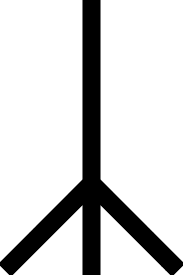 The Gar-Rune cannot be placed within the Four AEttir, so could come at the beginning or at the end. To fit with this it is placed at the end. 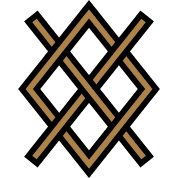 It is the 33rd rune; this is the number of the highest degree in Freemasonry, a number that has to have some occult significance, even though masonry is now the Counter-Initiation. We have covered the meanings of each, but should be reminded that the 'cup' or 'chalice' would originally have been a horn, and this would be the 'Horn of Plenty' which again occurs in various Germanic & Celtic Myths. The 'horn' is also symbolic of male virility, and the 'Horn of Plenty' can also symbolise the female and fertility. There is also the Cauldron of Rebirth which resurrects the dead who can rise again and again to do battle, found in Irish Mythology and Germanic Mythology (if they are not both the same). This is the Everlasting Battle which forms part of many Aryan Myths. Going back to the Fisher King, also known as the 'Wounded King' or the 'Maimed King', he is the last in a long line of 'Guardians of the Grail'. He is wounded in the 'groin' or the 'thigh' which is a hidden reference to the fact that he is unable to reproduce his Royal Lineage of the Graal. Only the one who asks the right question can heal this 'wasting wound'. At the same time as he gets this wound the land becomes a 'wasteland', usually seen as Logres. This has been given various meanings but seemingly overlooking the obvious. The 'Fisher King' is the Sacral King whose rule depends upon his Sacred Marriage with the Land (Sovereign). The wound, in most cases, is due to his wedding the wrong woman, a woman not chosen by the Grail. The inference here is that because he is not wed to the land, the land itself becomes infertile and a wasteland. The quest for the Grail is to right this, to heal the Wounded King and the Sacred Land. Now we can see the full significance of these Four Hallows because they are the key to the 'Mysteries of the Graal' and to the struggle that we today have taken up. I have mentioned the significance of the aspects of Woden as the 'Priest' and Ingwe as the 'Sacral King'; in the Waene-Cults Frey (Ingwe) and Freya are both husband-wife and brother-sister which is a main feature of this cult. The Sacral King is a Solar-Deity, made clear when we recognise that he 'dies' at the Midwinter, being 'drowned' in the sea as he disappears over the western horizon. He is then 'reborn' three days later on December 25th, which is why this date is significant. Some Norse Myths are based around the 'drowning' of a king in a vat at Midwinter. The Sword - Sword of Wayland Magazine/Sword of Hengest Newsletter. The Spear - Spear of Woden Magazine. The Stone - The White Stone of Ing - The Stone of Origins. The Cauldron of Rebirth - The Three Cauldrons/Horn of Awakening. 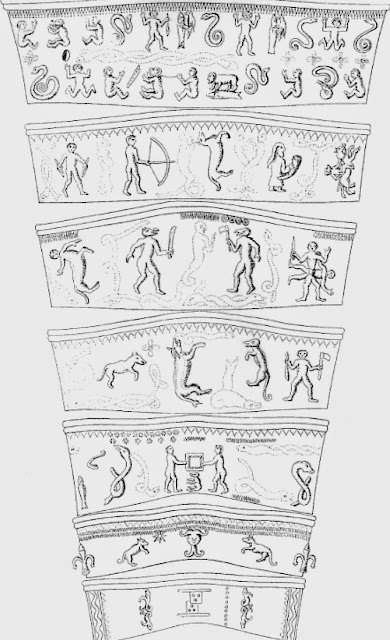 The above is a scene from the Gunderstup Cauldron found in Denmark; first thought to be Celtic some scholars now reject this due to there being elephants on it, thus seeing it as 'Scythian'. This does not matter, what matters rather than petty arguments as to who made it is the content on the cauldron. The plate above shows a large figure (a god presumably) holding a man upside-down over a cauldron. A line of warriors faces towards the god; above this is a line of horsemen facing away, suggesting a transformation and rebirth through the Cauldron of Rebirth. Between the two rows is a 'fallen tree' which suggests the 'Tree of Life'. In Norse Lore the Horn of Heidrun sustains the Einheriar in Valhalla; Heidrun is the she-goat related to the Gateway to the Gods (Capricorn), and this is another version of the 'Horn of Plenty'. We find a Christian priest complaining about the Heathen Saxons of Devon worshipping a 'Stag and Snake', the very same symbols as that on the cauldron. He also mentions that these are associated with the Irminsul, and here again this links to the 'Tree of Life' on the cauldron. These are all common Aryan Symbols. The figure of the god 'resurrecting' the Warrior-Heroes in Valhalla is important because they incarnate at will to take up the Eternal Struggle over and over again throughout the ages.